Our hotels offer a variety of conferencing, banqueting and partying options to cater to the different purposes of our clientele. 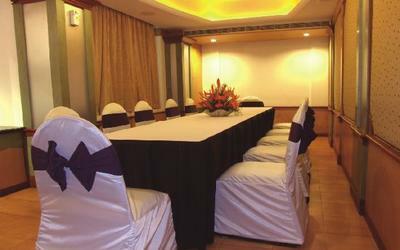 Apt for conducting small gatherings, especially conferences of confidential nature, the Imperial is the smallest of the three banquet halls in Windsor Rajadhani. 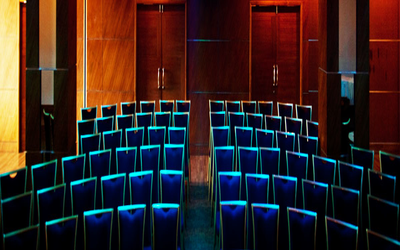 Located at the first floor, the Imperial is equipped with most modern video conferencing facilities and audio-visual apparatuses in addition to excellent seating facilities and arrangements. 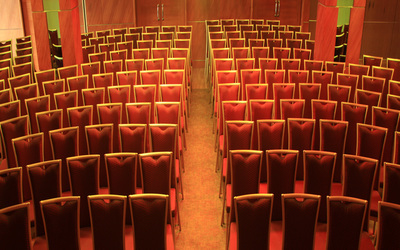 The Regent, located at the third floor can be used for small as well as fairly big seminars with 150 pax capacity. With excellent seating capacities, audio-visual aids and conferencing facilities, the Regent is set to define the elite banqueting in its own measures. 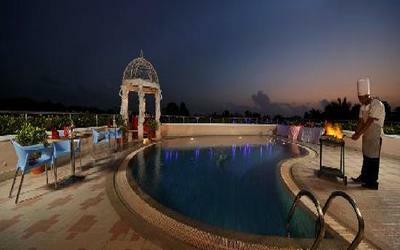 Located on the third floor of Windsor Rajadhani, the Majestic also provides 150 pax capacity. But, it can be adjusted to its half size using mechanical partitions according to the convenience of our clients. It will be appropriate for small parties and company get-togethers. Pool Deck, the party area set close to the swimming pool at the fourth floor is a special place to enjoy some moments of sharing and merriment with your dear ones. 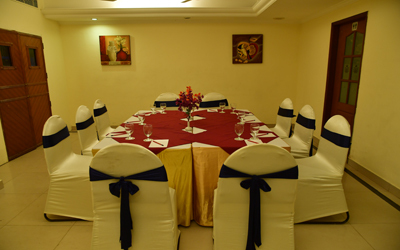 It is appropriate for parties of reunion, get-togethers, marriage receptions, birthday parties or whatever. 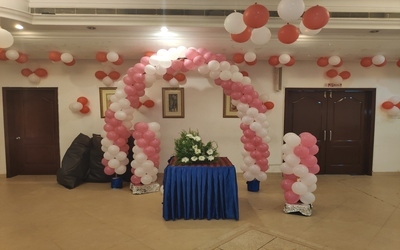 Maurya's banquet hall, named lotus, with its superlative luxurious facilities is an ideal place for all your personal and social functions like banquet dinners, corporate functions, fashion shows, product launches and even theatrical shows. with a touch of royal in every matter, Lotus can accommodate up to 150 people at a time and is provided with an ultra-modern A/V system. The lilly is an ideal place for conducting Board Meetings, Round Table Conferences or Business Meetings. 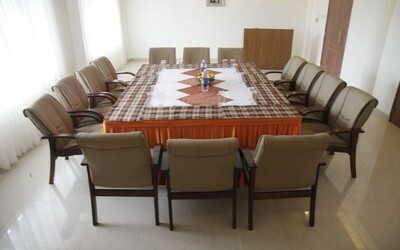 The room has a seating capacity of 20 and comes with state-of-the-art A/V and AC system. The orchid is suitable for any and all events, ranging from banquet dinners,corporate functions,fashion shows, product launches and theatrical performances.It can accommodate 30 people in theatre shape, u shape 15 people. 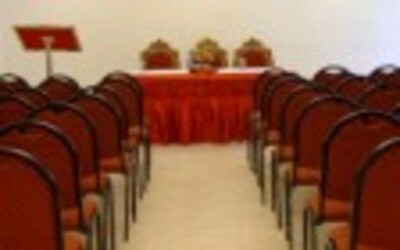 The conference hall is ideal for small conferences and business meets. It can accommodate 15-20 people. 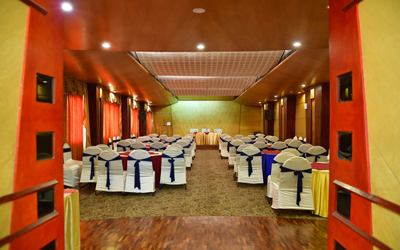 This banquet hall is available for all your meeting needs. Lotus is a U shaped meeting room. Orchid is a big party hall for all your party needs at your easy access. 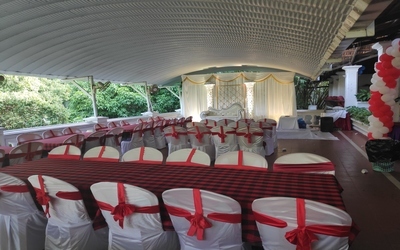 Nandanam is an outdoor meeting area an apt place for corporate team lunch and weddings. 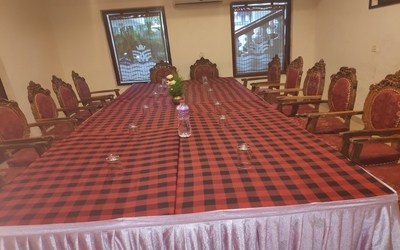 Lotus is a boardroom with a max capacity of 20 seats. 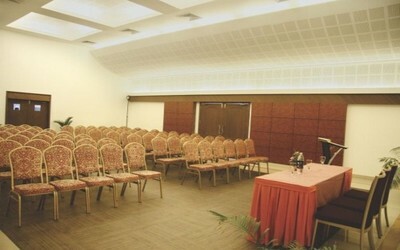 The hall is located on the third floor of Indraprastha Rajadhani. 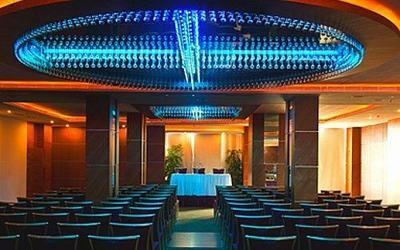 Orchid is a boardroom with the capacity of 20 seats and 30 seat capacity in theater style. 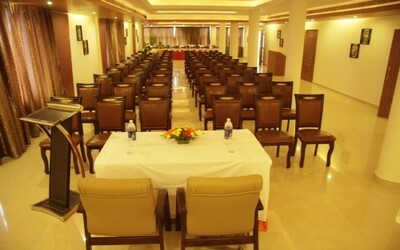 The Banquet Hall with the capacity of 100 seats. Its located on the second floor of Indraprastha. * Provides 150-200 seats in Theatre style. * Provides 75 seats in U - shape. * Provides 100 seats in classroom mode. 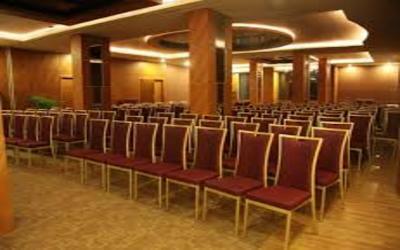 * Provides 150 seats in banquets mode.